Broccoli Apple Salad is heavenly. 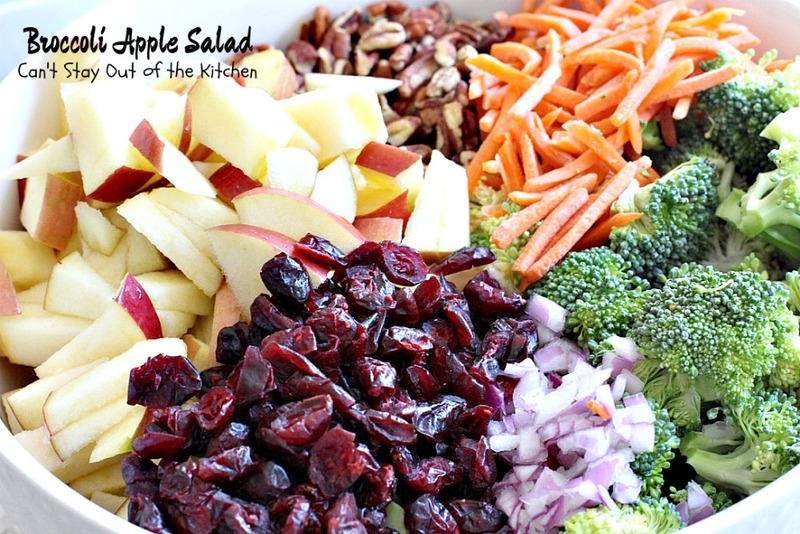 When I first saw this salad in my Blog Lovin’ feeder, I have to admit I was ready to eat a bite right away! I enjoy Broccoli Salads anyway and I’ve already posted two of them. 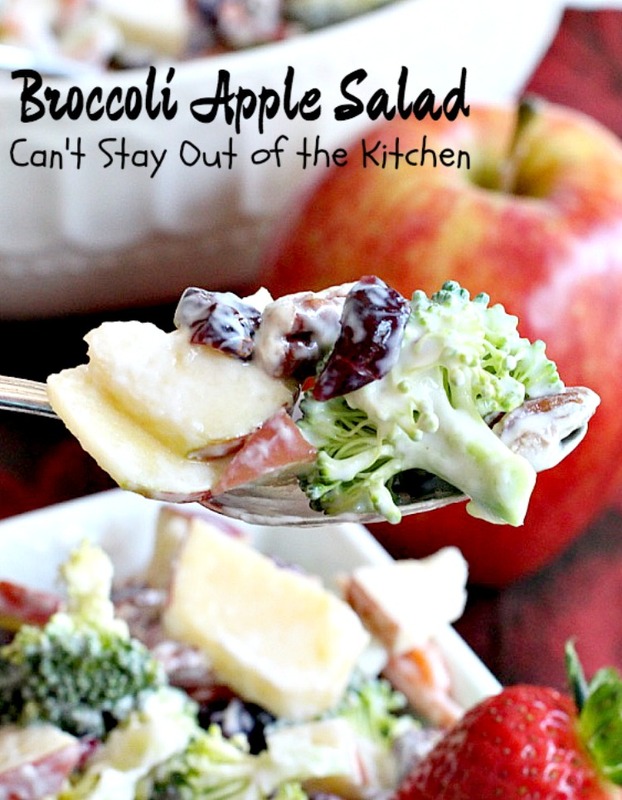 But when I saw this one, I was intrigued by pairing broccoli and apples and knew I just had to give it a try. It was superb and so worth putting on a regular dinner or potluck menu. 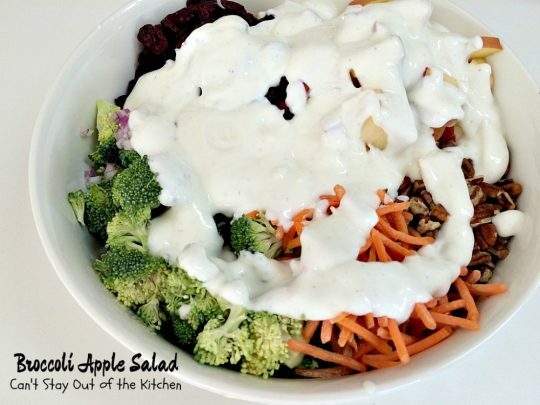 This one combines apples, broccoli, shredded carrots, red onion, craisins and pecans with a lovely Greek yogurt dressing. This is certainly a healthier version, especially if you substitute honey for the sugar in the dressing. I used sugar but felt that one tablespoon was not sufficient making the dressing a little more biting than I desired, so I increased the sugar slightly. I would probably do the same if I used honey. But if you prefer a sweeter dressing, simply add additional sugar or honey. I actually made this recipe for a family who recently gave birth to their fourth child. But, of course, the cook always gets a sample of everything. 🙂 I have to admit I really enjoyed this. 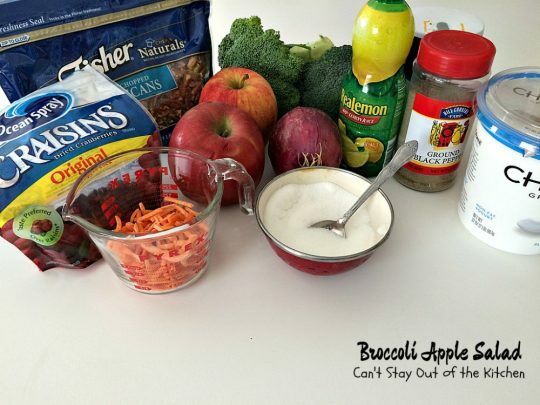 I liked the extra crunchiness from the broccoli, pecans and carrots, and the apples and craisins provide a little sweetness to it. I prefer using Gala or Fuji apples as they are sweeter than many apples and I like the crunchiness instead of having mushy apples. If you want to dazzle your company or friends at your next barbecue or potluck dinner, then bring a batch of this salad. You will probably find that every last morsel is scraped from the bowl because it’s soooooo good. Enjoy. 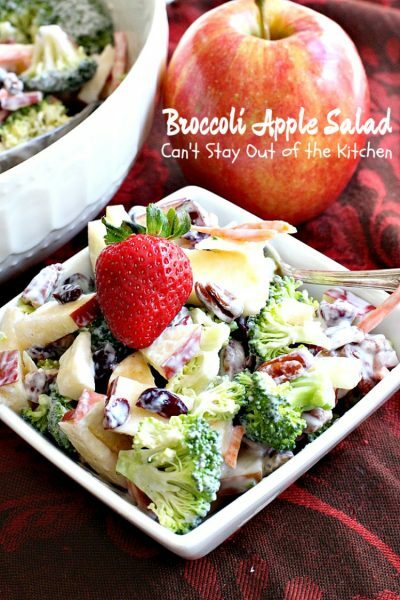 Broccoli Apple Salad is healthy as well as delicious! 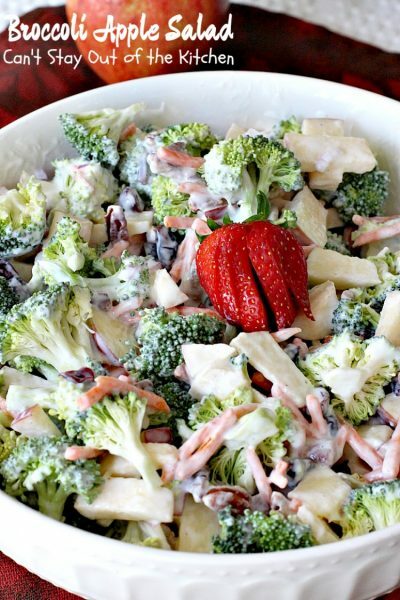 Every bite of this salad is absolutely delightful! Broccoli Apple Salad is a great salad to take to potlucks, backyard barbecues, or for company dinners. I used these ingredients. You can also substitute honey for the sugar in the recipe. 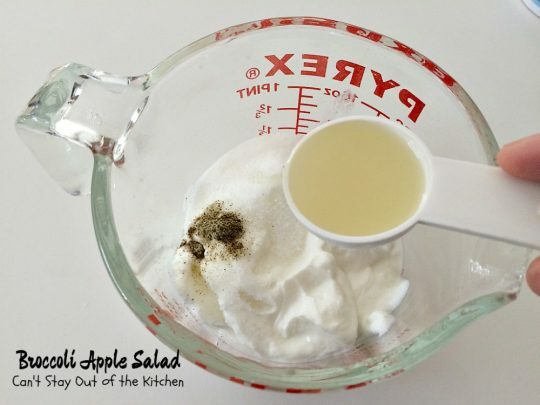 To make the salad dressing: place Greek yogurt in a bowl or large measuring cup. Add salt, pepper, lemon juice, sugar or honey. Whisk ingredients to combine. 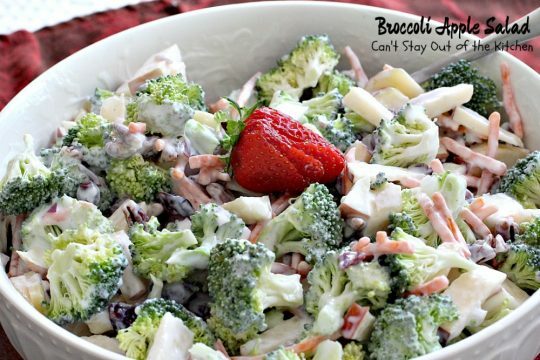 Place broccoli florets, apple slices, craisins, red onions, matchstix carrots and pecans in a large salad bowl. Stir ingredients to combine. Refrigerate until ready to serve. This salad is so scrumptious, it will soon become your go-to salad for company. This scrumptious salad is great for holiday menus, potlucks, backyard barbecues or anytime you're getting together with company. Quick, easy, delicious and gluten free! 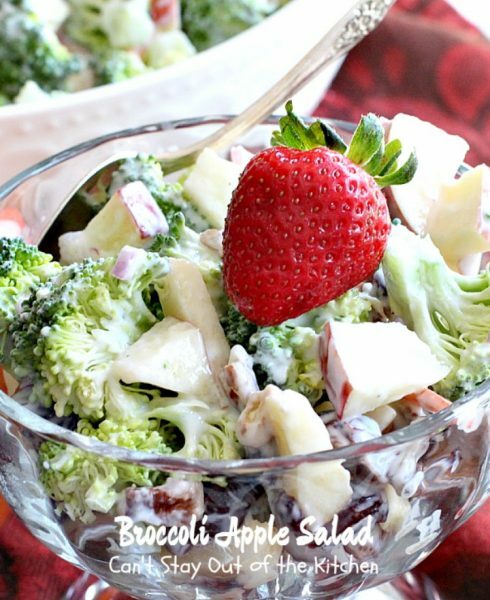 In a large bowl combine broccoli with all other salad ingredients. Whisk dressing ingredients and pour over top of salad. NOTE: I increased the sugar from the original recipe but this is still not a sweet salad dressing. Add additional sugar or honey if you prefer a sweeter dressing. This scrumptious salad is great for holiday menus, potlucks, backyard barbecues or anytime you’re getting together with company. Quick, easy, delicious and gluten free! I increased the sugar from the original recipe but this is still not a sweet salad dressing. Add additional sugar or honey if you prefer a sweeter dressing. 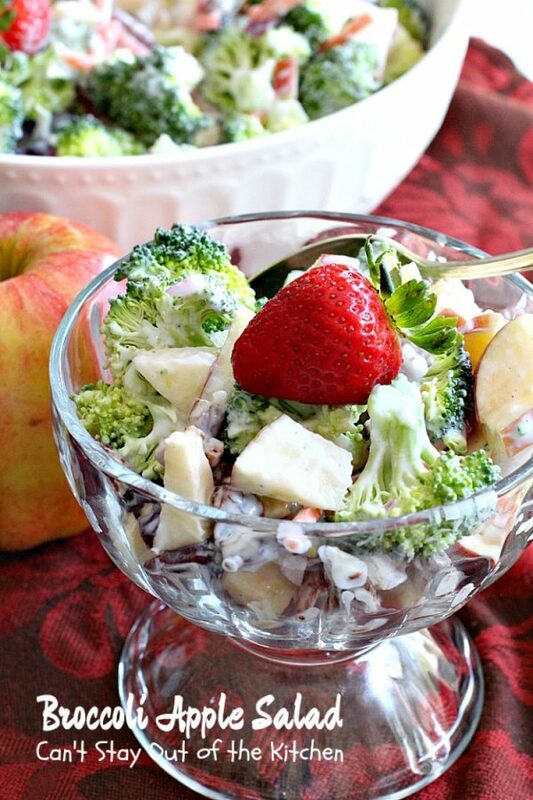 Broccoli Apple Salad is great for holiday menus, too. 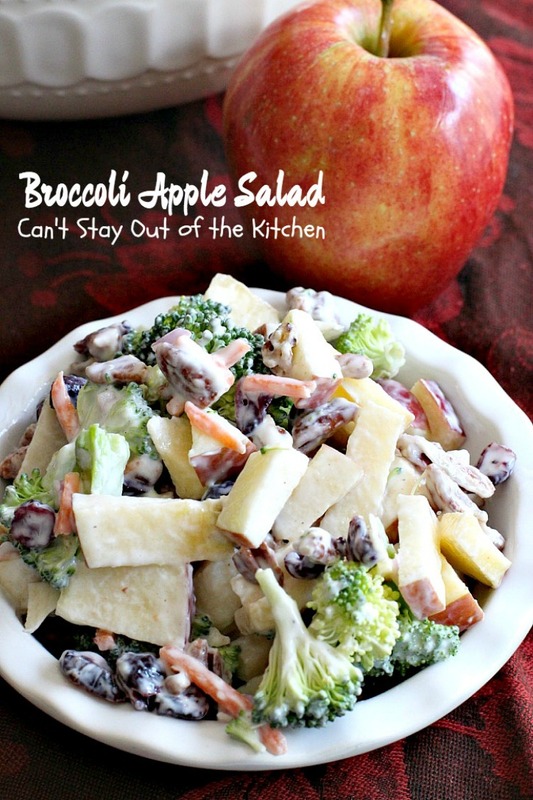 Broccoli Apple Salad rocks. You’re sure to love it. The salad sounds delicious! I always make a similar one, but it has pomegranate in it. I have to try yours! I love broccoli salad, too! The addition of apples and carrots seems like it would be a great combination. Nice that you don’t have to feel as guilty eating this one due to the yogurt dressing. Thanks, Teresa! Thanks, Shari. It was really good. I never thought of putting apples with broccoli before, but it really works!